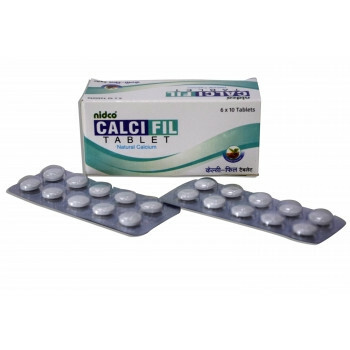 Calcium-fil - a combination of herbs and minerals that are rich in easily digestible calcium. Calcium-Phil will provide your body with the daily norm of calcium. Content: Arjuna, Asthisanhaar, Gojivha, Vanshlochan, Kukutantwak Bhasm, Shudh guggul has, Godanti bhasma. Dosage: 1-2 tablets 2 times daily or as directed by a physician. In our store You can buy authentic Calcium-Phil Nidco at the best price!